IF THERE’S A GOD, WHY IS THE UNIVERSE SO BIG? All that space out there makes our tiny planet insignificant, say the skeptics, and therefore of no consequence. No intelligent God would make a planet so tiny in comparison to such a mindbogglingly huge universe. For the life of me, I can’t see why this is seen as a good argument. The very same people would, were the universe only a little bigger than the earth, complain that there can’t be a God or the universe would be much bigger. That’s the way it is with those determined not to believe: they’re always looking for excuses not to believe. The fact that the universe is so vast only demonstrates to us the immeasurable, infinite power of our creator. Why would an infinite God create a tiny universe? That wouldn’t make any sense. The size of what we see out there is an unmistakable sign to us that our creator is limitless. It’s there for his glory and pleasure. It’s there as a demonstration of his awesome nature and creativity. The “heaven of heavens cannot contain him” (1 Kings 8:27) and the New Testament tells us that he fills all things (Ephesians 4:10). There is no place in this universe where God is not. And since he created the universe-time, space and matter (Genesis 1:1) he must also be outside it and beyond it, and not subject to its laws. 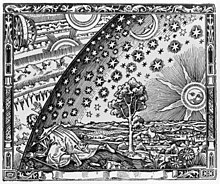 Critics claim that the Bible is primitive in its understanding of the cosmos. It’s true that it isn’t a twenty-first century science manual, but it’s also true that no statement in the Bible contradicts true science. God’s intention was not to blind the reader with science but to help him understand that God is its author. When we consider how unique is the earth in relation to anything we know of in our solar system and in our universe, we can’t honestly dismiss our planet as being “insignificant”. Its the most beautiful, incredible “speck” we know of. It’s far more significant than any other “speck” we know of. Life is only possible on it because of the many thousands of “fortuitous” conditions which meet perfectly here, and as far as we know, nowhere else. Why is the earth so small in comparison to the rest of creation? Well, I don’t know about you, but as much as I’d like to see the world, I’ve only seen parts of it, because it’s just too big to get around, unless you happen to have the money and the leisure time available. God instructed mankind to “fill the earth”. He didn’t create it to be empty, but to be populated (Isaiah 45:18). We’re led to believe that the earth is overpopulated, but I once calculated that every person on the earth could fit in the tiny nation of Ireland, each with an area of something like a hundred square feet. Of course, they might not all get along, and they might get hungry, but the point is that the world is plenty big enough for its human population. Earth is big enough for us-for now. The creator has a plan for it, and for everyone who is prepared to recognize him and choose him. You can find that plan towards the end of the book of Revelation. My own conviction and dream is that the universe will in the future be explored and colonized by that mass of humanity which has chosen to recognize and worship the creator. This dream fits the promise of eternal life, and it demolishes that stupid, condescending idea some people have that believers expect to be floating on a cloud and playing a harp for all eternity. God is big, and so are his plans for mankind. WHY IS EARTH SO SMALL? WHY IS THE UNIVERSE SO VAST? Even in the professing Christian world there are many individuals and organizations claiming to represent him who want the rest of us to see God as they do: small, ineffectual, effeminate, powerless, weak-minded and irrelevant. He can’t create and he certainly couldn’t do it in six days. He can’t say anything truthful and he has no ability or will to preserve even what he does say. He has no power over death, he doesn’t know his own mind, his promises are empty and vacuous, and his standards sway in the winds of time, opinion and fashion. In the words of a certain world-leading, head-of-the-Church type person, God “doesn’t have a magic wand”. The message of the Bible is totally opposite to this attitude of “experts”. God, according to everyone from Genesis to Revelation, is unimaginably huge, powerful and holy. He is so amazing in his being, his character and his standards that were we able to get a glimpse of him in our present form we would immediately die-if only from the shock and awe of seeing him. …who is able to build a temple for him, since the heavens, even the highest heavens, cannot contain him? (2 Chronicles 2:6). The most intense target of the “Make God small” movement is Jesus Christ. Entire religions and pseudo-Christian cults fiercely contest and deny the idea that Jesus was anything more that a prophet, a teacher, a radical, a revolutionary…a man. For by him all things were created, in heaven and on earth, visible and invisible, whether thrones or dominions or rulers or authorities—all things were created through him and for him (Colossians 1:16). The diminishers not only work to wipe away or allegorize indispensable Old Testament books such as Genesis, but fundamental New Testament books also. John’s gospel, they say, is a fantasy. Paul’s writings are faulty. The gospels are flawed and need to be hugely edited, or to use a popular political tool these days-“redacted”. It makes me wonder why people claim to even be Christian when they don’t actually believe anything of it. Why don’t they take up Buddhism or origami instead? John Doe’s writing are far more reliable they say, and proceed to create their own version of the ancient Scriptures, when the originals claim to be the very Word of God…a dangerous risk and miscalculation. “He is worthy of death,” they answered (Matthew 26:63-66). Jesus Christ was crucified because he was claiming to be God’s one and only Son. He was “blaspheming”. Therefore, in their minds, he had to be shrunk. The fact that he had worked incredible miracles meant nothing to them. After all, anyone can walk on water, right? Anyone can turn water into wine and make a blind man see and a lame man walk, right?